Next time you’re shopping, be on the look out for a blazer with pockets. Pockets can be lifesavers when you are standing at the front of the room. No, I don’t mean you should cram your hands into them. Rather, they can help ensure you’ll be ready when it’s your turn to talk. Pockets can hold helpful tools. Note cards in the 3×5 size will fit. You can easily pull them out should you need a prompt. Having a tissue handy is a must if you are suffering from a cold. And, a throat lozenge will ease a scratchy throat or cotton mouth. If you use a remote, you won’t have to hold it the entire time you’re talking. As far as hands in the pockets – one hand is poised but two hands is a no-no. It will look sloppy and if you’re nervous you will likely clench your into fists. “Who do you want to be?” First Lady Michelle Obama challenges the graduates of Eastern Kentucky University. In May 2013, the First Lady called on the students to give a hand and reach back to others who need help. Tips and strategies to project your best self and earn the respect you deserve. Learn more about the amazing women featured in The Well-Spoken Woman. Each chapter highlights a woman who has mastered a skill. See some of these speakers in action. Analyzing their signature styles will help you articulate your ideas and carry yourself like a leader. [expand title=”Chapter Five: Melinda Gates – Strategic Messaging”]When it comes to the topic of global health Melinda Gates takes the subject of strategic messaging very seriously. At the Bill and Melinda Gates Foundation a vague sense of a vision isn’t sufficient when lives are on the line. Gates delivers purposeful messages to inspire audiences and elicit a response. Stop putting yourself in the position of frantically jotting notes in the cab or pulling out last year’s presentation the night before. Former American Red Cross executive and U.S. Senator, Elizabeth Dole is always prime time ready. “Preplanned Spontaneity” is an approach that will help you prepare for when things go right and when they go wrong. 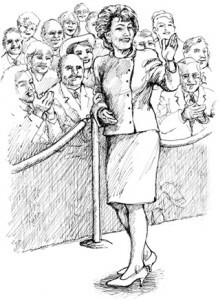 Speechwriting is not something that’s necessary only forceremonial occasions or formal events. Whether you are delivering a keynote address, making a toast, or giving a briefing, it is essential to organize your thoughts on paper. If you don’t write it first you won’t be able to say it nearly as well. 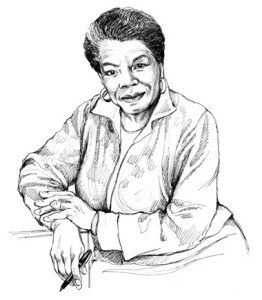 Maya Angelou’s powerful pen can turn a humdrum presentation into one that will leave a lasting impression. With her signature look and no nonsense advice, the people’s financial advisor isn’t your typical cable TV host. 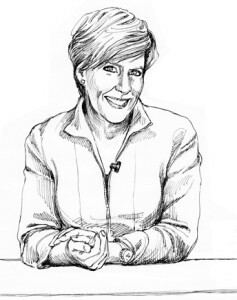 Suze Orman is an accessible personality who projects her best self on camera and off. This chapter demystifies the camera with specific tips on how to sit, where to look, and what to wear. The SHAPE UP TV techniques put you in the driver’s seat so you can present a polished, professional on-screen image. [expand title=”Chapter Nine: Madeleine Albright – Charming Troublemakers”]You can be ready for troublemakers who may attempt to sabotage your presentation or news reporters with biased questions. Former Secretary of State Madeleine Albright provides a how-to on handling indifferent, skeptical, or even hostile audiences. Learn how Albright went toe-to-toe with foreign leaders charming them with her wit and firm resolve. [expand title=”Chapter Ten: Hillary Clinton – Podium Presence”]Hillary Clinton has become a leader with international podium presence. The great ones don’t get there alone. Behind every strong woman there is a ready and able support team. The final chapter offers insights on what each of us can do for our sisters, daughters, mothers, colleagues, and friends so they can be well-spoken, too.